Mr. George Miller, a native of Monroe, Michigan, received a BS in Chemical Engineering in 1959. While at Michigan Tech, he was a member of Delta Sigma Phi Fraternity and active in the AIChE Student Chapter. Upon graduation, he was commissioned a Second Lieutenant and assigned to Keester Air Force Base in Biloxi, Mississippi and finally to Headquarters 8th Air Force in . . . Retired Michigan Technological University Materials Science and Engineering BS EMY 1961, MS EMY 1962, PhD Materials Science 1967 Karl graduated from Michigan Tech with his B.S. in Metallurgical Engineering in 1961, and his M.S. in 1962. He earned a PhD in Materials Science from Northwestern University in 1967. Karl was . . .
Gary Hagstrom completed his baccalaureate degree in civil engineering in 1972 and accepted employment with Standard Oil of California (later renamed Chevron Corporation). 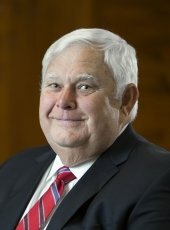 He obtained his Professional Engineer license in California in 1974 and spent 35 years with Chevron, retiring in 2007 as President of Chevron’s Project Resources Company. He initially worked . . .